How do I move the note database to a different folder? Important! Before moving the database, create a back-up for the old version. 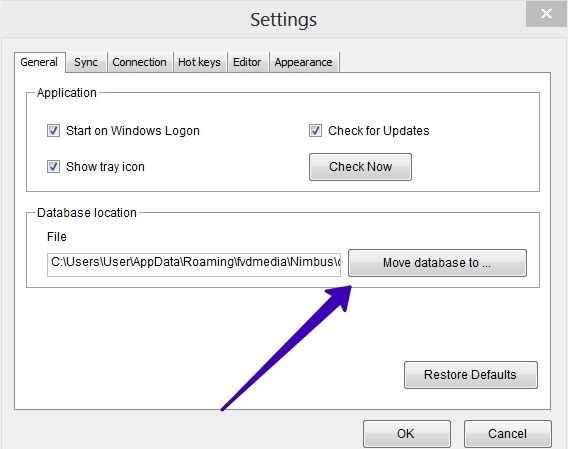 Open folder C:\Users\YourUsername\AppData\Roaming\fvdmedia\Nimbus and copy the folder with your account e-mail to a different location. Open Settings. In Database location, click on Move database to… In the window that opens, you can select a new folder and change the database name if desired. Once the database is moved, you need to restart the app for the changes to go into effect. Important! If the new folder for some reason already contains a Nimbus Note database, it will be overwritten!